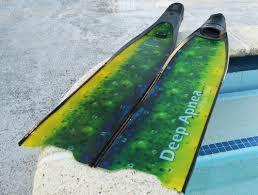 All Deep Apnea S-Glass blades are manufactured with 100% S-Glass Fiber. The chemical formulation of S-glass differs from the standard Fiberglass. S-glass is 30% stronger and 15% stiffer and lighter than Fiberglass and retains these properties up to 1500° F. S-glass is also considerably tougher than Fiberglass; there are not comparison between those two in terms of stiffness and performance. 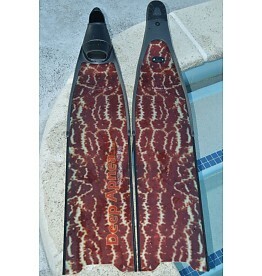 When the application is for a Freediving fin the weight is a factor too, S-Glass Fins are lighter than Fiberglass Fins and also the response of the S-Glass Fins compare to the Carbon Fiber ones. The S-Glass Fins are manufactured following the same formulation proprietary of Deep Apnea has for the Carbon Fiber where the Multilayer disposition of the fibers inside of the core creates a “Variable Parabolic Stiffness” (VPS), resulting in a faster blade response. 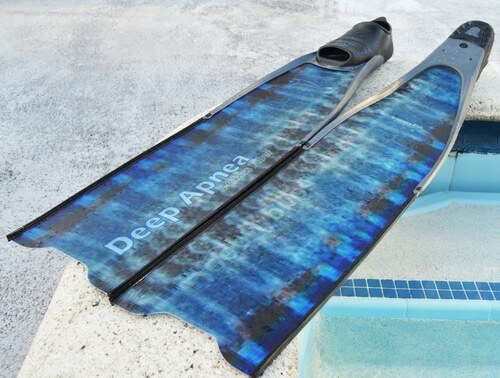 This delivers a comfortable surface swim and also a strong ascent, with considerably less effort, which in turn saves oxygen during each dive. The S-Glass Fiber Fins comes with 2 years warranty.